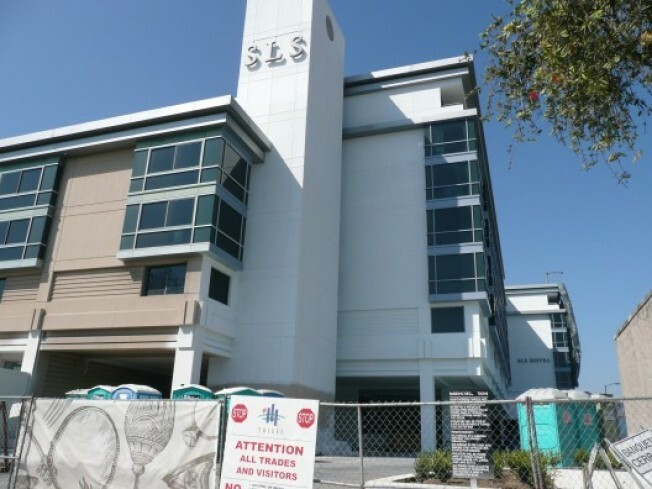 In anticipation of a November opening, the marketing folks behind the SLS Hotel at Beverly Hills, that forthcoming hotel from SBE Entertainment Group, showed off an image of the monkey crest for the exterior wall last month. And more monkey business: A recent trip to the construction site revealed monkeys have appeared on the outside entrance way. Additionally, the hotel, located at 465 S. La Cienega Boulevard, is slowing turning white, shrugging off its old teal and taupe facade (this is a redo of former Le Meridien hotel). Meanwhile, that first monkey crest remains propped up in the driveway court area of the hotel. Given the rash of metal thefts in the area, best to put those monkeys somewhere safe.